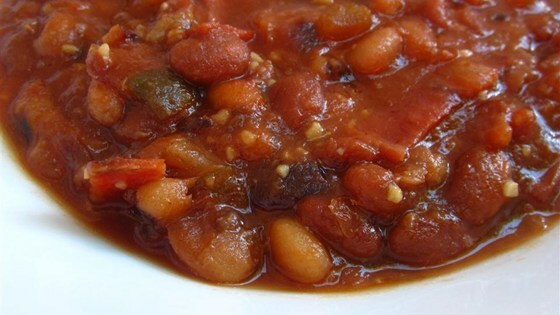 "Very easy and tasty baked beans. Made these for tailgating for football games all the time and were a big hit!" 1Heat a large skillet over medium-high heat. Cook and stir beef and onion in the hot skillet until browned and crumbly, 5 to 7 minutes; pour into a slow cooker. 2Cook and stir bacon in a large skillet over medium-high heat until evenly browned, about 10 minutes; add to beef. 3Stir pork and beans, kidney beans, white sugar, ketchup, brown sugar, vinegar, and liquid smoke into the beef mixture. 4Cook on Low for 6 to 8 hours.